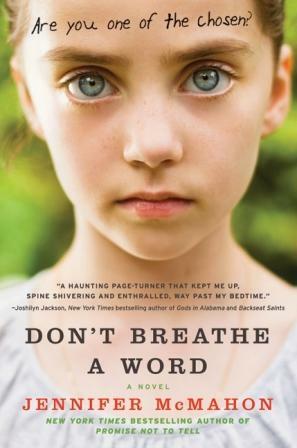 This week's teaser is from Jennifer McMahon's Don't Breathe a Word, which I'm enjoying -- mostly. (Phoebe, the heroine, and I are a bit at odds about her behavior.) Thankfully, the other characters -- there's about five who are pretty central to the story -- are fascinating and complicated and engaging enough that I can sort of ignore Phoebe when she annoys me. Picking a teaser that wasn't a spoiler was remarkably challenging! So many tidbits get revealed with each page, which builds tension deliciously but makes for difficult quoting. Still, I think I found a passage that gets across the deceptively simple style of the story and it's lovely creepiness! Just her ears playing tricks on her. Maybe the footsteps were part of the dream she'd be having, something about teeth and keys and doors. She was about to climb out and head for home when a scream filled the woods, bounced off the walls of the cellar hole, through the trees -- a scream so loud she was sure that not one human being could be making it. Surely the woods, the animals, even the soft beams of moonlight were all screaming together. What an excellent teaser. You're right about the creepiness! I've seen reviews for this one, but getting a little taste of the writing makes me all the more intrigued! Thanks for sharing. Great teaser! I'm looking forward to your thoughts on this one. I'm anxious to read it!